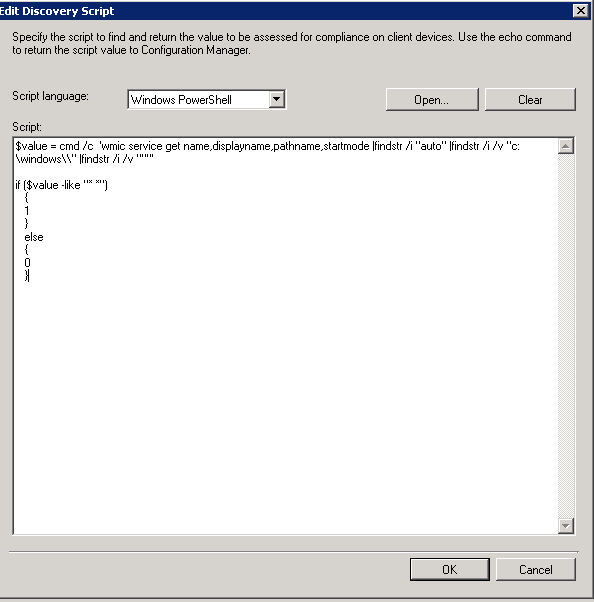 Remediate unquoted service path vulnerability via compliance item. I have now been to three different environments that have this vulnerability. In all three environments this was one of the top offenders per total count of vulnerability. This not something that is necessary a problem that will cause outages if not patched, but potential for malicious programs to run.There are already published posts with great explanation of the vulnerability from CommonExploits, and Tennable. The scope of this blog post will be how to identify the vulnerability, how to manually remediate it, and how to auto-remediate it via the compliance item. Below we see that we do have 1 item that is vulnerable. 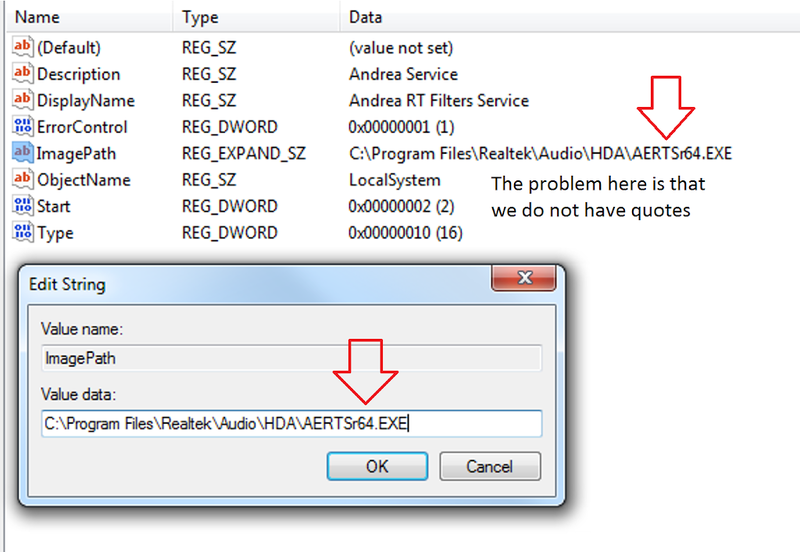 This is what the ACAS Scans are finding however it does not tell you where to correct this within the registry. 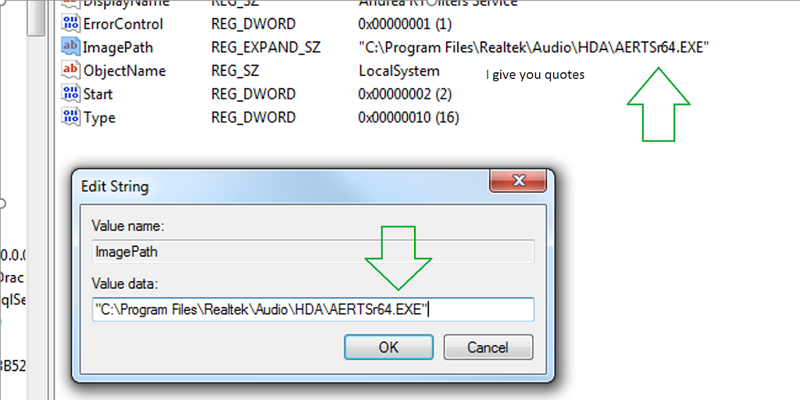 To remediate this we will have to locate the object within the registry and add quotes to the path. I believe there is a way to configure reporting to be more verbose to include the registry location but I am unfamiliar with the ACAS tool. We will create a compliance Item to discovery systems with the unquoted service path vulnerability and then remediate it. ‘This is a little complicated. At this point go ahead and deploy the configuration item you have just created. I would recommend only performing this against workstations but only after serious testing. Unfortunately I forgot to take a screenshot when I fist deployed this compliance item, but I do have one after half the systems checked for policy. After systems get policy we are now looking at a very high remediation percentage. This is what a successful report looks like for the configuration item. 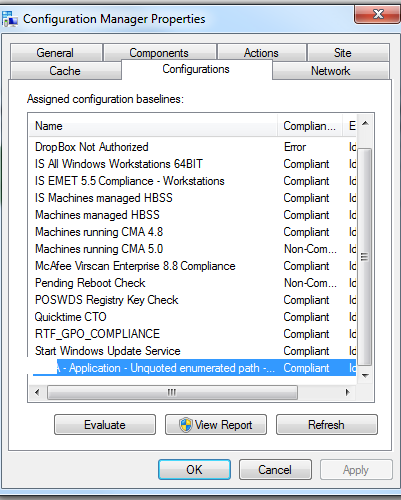 The compliance item can be downloaded on Technet here. 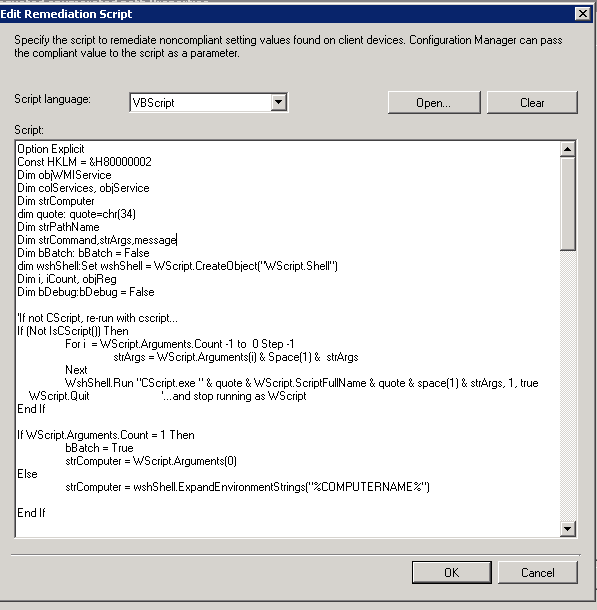 I would like to thank Khalid Al Alul, and Ricky Richard for their time in working on this configuration item. https://i2.wp.com/sccmf12twice.com/wp-content/uploads/2017/05/results.png?fit=1024%2C193&ssl=1 193 1024 chris buck https://sccmf12twice.com/wp-content/uploads/2018/08/SCCM-logo.png chris buck2017-05-09 00:26:002018-12-11 11:35:33Remediate unquoted service path vulnerability via compliance item.